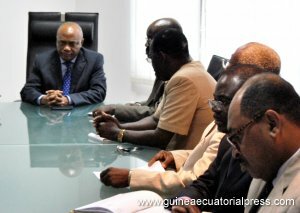 Equatorial Guinea Minister of Health received a delegation from the U.S.
Minister of Health – H.E. Tomas Mecheba Fernandez and his ministry, meeting with Philadelphia International Medicine with United States Delegation led by MAECI. After the meeting at the Chamber of Commerce of Bioko, the delegation from the United States was received by the Minister of Health and Social Welfare, Tomas Mecheba Fernandez, in his office at the ministry headquarters. Among the U.S. businessmen, there are medical specialists who have shown interest in investing in the health sector in our country.